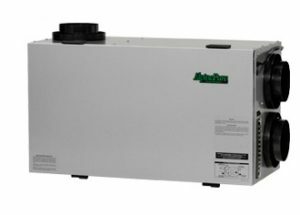 The WaterFurnace AlpinePure HRV (Heat Recovery Ventilator) is a device that moves stale contaminated air from bathrooms and kitchens from inside the home to the outdoors. At the same time it draws fresh, oxygen-rich air from outside, filters it and delivers it throughout your home. Stale, polluted air is constantly being replenished by an equal amount fresh, clean air. As the two air streams pass each other through the HRV they do not mix. However, they do pass on either side of an aluminum heat exchange core that transfers the heat from the air exiting the home to the fresh air coming in. The efficiency (around 83%) is high enough that virtually all of the energy is transferred and little energy is used to condition the incoming fresh air. During cooling the HRV removes the heat from the incoming fresh air and transfers it to the stale exiting air so that the incoming air is “pre-cooled”. 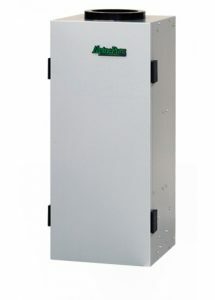 AlpinePure HRV’s are designed to be connected to bathroom and kitchen exhaust ducts, replacing the bathroom/kitchen fans. Independent switches activated in any bathroom turns on the HRV for a 20-minute period. The HRV can also be activated whenever the WaterFumace unit is heating or cooling, or for continuous operation by activating a separate switch conveniently located in the home. By utilizing the AlpinePure HRV for bathroom ventilation, ordinary noisy exhaust fans are eliminated, and fresh outdoor air is introduced indoors without a major efficiency loss. With AlpinePure HRV, the volume of stale discharged air and the amount of incoming fresh air is equal, providing a balanced system. Other ventilation strategies may cause depressurization of the home, causing air infiltration into wall cavities which can lead to moisture damage, rot or harmful mold. For the ultimate in air filtration, the AlpinePure HEPA filter is the best choice. It used the type of filtration technology required in hospitals and operating rooms. HEPA filters are the most efficient mechanical filters for removing small particles which can be breathed deep into the lungs. The AlpinePure HEPA has a 99.97% efficiency for particle sizes 0.30 microns and larger. The AlpinePure HEPA incorporates Turbulent Flow Precipitations (TFP) technology. This process involves a principle which illustrates when particle-laden air is forced through a narrow airway, the particles are repeatedly flung against the internal walls. If the walls are smooth, the particles bounce off and re-enter the airstream. The airway walls of the AlpinePure HEPA are made of fabric that traps pollutants as they are flung from the airstream. The result is a high rate of removal of even the smallest debris. Any particles not removed in the TFP process are captured by the primary HEPA filter cartridge. HEPA filter technology is the most effective way of removing large numbers of the smallest particles. Other less-efficient filtration technologies rate the efficiency in terms of weight, not volume of particles captured. It’s easy to understand that larger-sized contaminates (more than 5 microns) weigh more than smaller ones. However, the number of large particles in the air may actually account for less than 1% of the total number of pollutants in the air. The vast majority of the particles in the air are smaller than 5 microns, and these smaller ones can be more detrimental to your health, so it’s important to remove those by using devices like the AlpinePure HEPA. The A+ 2000 is truly a quality product, build to last a lifetime. Unlike some permanent air filters, the A+ 2000 used NO FOAM that may clog, degrade and restrict air flow, so it can provide a lifetime of dependable service. And there are not metal parts that could lead to corrosion or oxidation within the filter. A+ 2000 permanent Air Filters are designed to provide a balance between adequate air flow and filtration. According to NAFA, resistance to air flow, called pressure drop, causes your unit to work harder, resulting in greater energy consumption and possible damage to your unit. 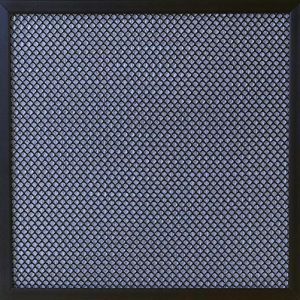 In selecting an air filter, the most important consideration is the ability to remove from an air stream the greatest number of dust particles whose size is of most concern. How slow or fast an air filter reaches its capacity greatly affects resistance, because a filter’s resistance will increase as it captures particles. That’s why it’s important to have a filter with a good balance of resistance to air flow and adequate filtering capabilities. Lab tested by the Air Filter Testing Laboratories, Inc. in accordance with the American Society of Heating, Refrigeration and Air Conditioning Engineers ASHRAE Standard 52-76.